Using your wood heater correctly will improve Canberra's air quality, save you money, and keep your home warm during winter. Buy wood from an authorised firewood merchant and store it in a well ventilated covered space. Only use dry, well seasoned, untreated wood. When starting your fire, always have the air control fully open and use plenty of kindling to start a hot fire quickly. Place logs in the firebox with about 2cm between them to allow good air flow. Use smaller logs when reloading, they make it easier to establish a hot fire quickly and allow the fire to burn on high for 20 to 25 minutes. Do not overfill the heater - use 2 or 3 small logs in the heater, never 1 large log. 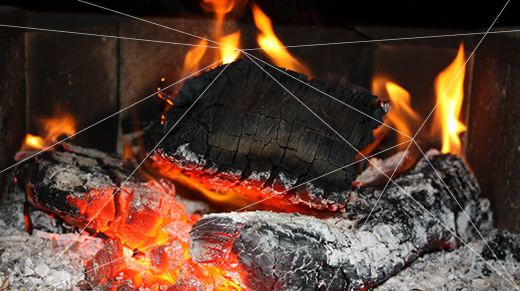 Don't let your fire smoulder overnight - keep the air control open enough to maintain a flame. A fire set on low causes excessive smoke pollution. Winter energy saving - doing the small things to reduce your energy use can have a big impact on your bill without compromising your comfort. Actsmart offers some quick and easy tips to help you use less energy, which can help you save money while staying nice and cosy. Air pollution - all ACT residents and businesses have a responsibility to care for the local environment. Wood Heater Replacement Program - The Wood Heater Replacement program aims to reduce winter air pollution from wood smoke, offering a financial incentive to replace an old wood heater with an energy efficient alternative. Firewood collection – taking firewood from reserves is illegal and can have a negative environmental impact by removing the homes of insects, bugs and beetles which are an important part of the ecosystem. Firewood Merchants – Firewood merchants are regulated under the Environment Protection Act 1997 and must comply with the requirements as set out in Section 14 of the Environment Protection Regulation 2005. These requirements include that the merchant must supply customers with seasoned wood, it must be offered and supplied by weight (not by volume) and each customer must be given a written statement of the weight of the load supplied and a pamphlet supplied by the Environment Protection Authority that sets out recommended wood burning practices and encourages compliance with those practices.